Close up of some of the Chaired sleeper wagon GWS91200 details. 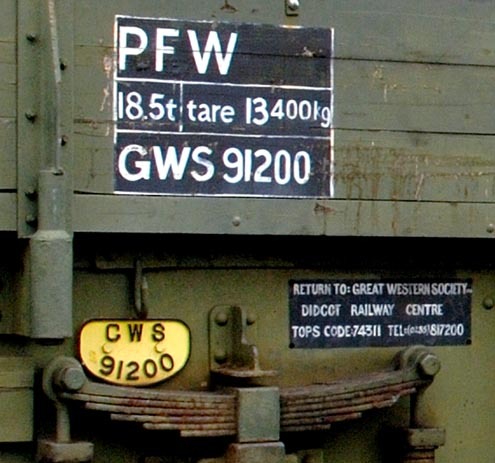 This Chaired sleeper wagon is number 100682 it was built in 1939 to Diagram T.12, Lot 1313. It is as well as being a part of the Great Western wagons saved at Dicot, it is also still a working wagon. It can still be used on the main lines as it has a Tops code 74311. Note the air pipes fitted for todays frieght trains. The Close up photo above gives details of it present day mainline number PFW GWS 91200. The wagon is used to bring in heavy parts to the centre and can be used on the mainlines in the UK. I think this may be one of the only GWR built wagons to have an up to date Tops code ? This wagon is one of around 50 railway wagons most of which were built by the great Western Railway or the British Railways Western Region that have been saved at the Didcot Railway Centre that is next to the Didcot mainline railway station. These wagons in the lis below are just some of the wagons that have been saved at the Didcot Railway Centre.